In the wake of the recent controversial personnel decisions made by the Montclair Board of Education, many have questioned the legitimacy of the operation due to a lack of transparency. After Laura Hertzog and Franklin Turner were sworn in as President and Vice President of the Montclair Board of Education, there were pledges of transparency and cooperation from the Board. These pledges have been largely ignored by the Montclair Board of Education. The hypocrisy of the Montclair Board of Education was on full display when Jeff Gannon, Athletic Director at Montclair High School, was demoted from his position without any documented performance review or reasoning. At a meeting in which over 50 students and 45 adults turned up to protest the decision, interim superintendent Barbara Pinsak and the board failed to address the issue. 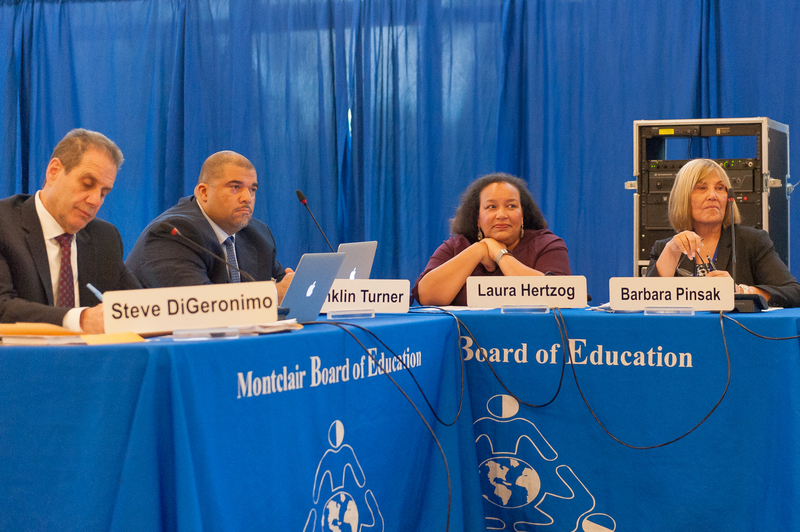 The failure to clearly define the processes and happenings within the Montclair Board of Education has been a longtime theme, even when it is vitally important for the community to understand how their tax dollars are being spent. And there are a lot of tax dollars. The Montclair Board of Education on Tuesday, May 16, 2017. Photo by Scott Kennedy for The Montclair Dispatch. In 2016, Montclair levied $215,491,748.14 in taxes. Of that money, $122,449,381 was budgeted to the Montclair Board of Education to use for the public schools in Montclair. In stark contrast to the transparency the municipal government of Montclair provides, the Board of Education releases no supporting documentation for their meeting agendas. The Board of Education simply posts ‘dead’ PDF files with no links to any supporting documentation.. While the municipal government posts each bill, budget and document online for the public to read, the Montclair Board of Education abstains from educating the public on the issues they address in meetings. The municipal government of Montclair provides advanced notice to taxpayers on what bills they are paying and to whom. At the Board of Education meeting on May 16th, the Montclair Board of Education had 50 items on their agenda. This agenda was not made available before the meeting. No documents have been provided by the Board of Education to inform the public of anything further than what is handed out at the meeting on the printed agenda. This reporter was forced to put in an Open Public Records Act Request (OPRA) for supporting documentation for those agenda items. Presumably, this documentation should be in the hands of every board member in order for them to properly vote on the issues. The Montclair Board of Education responded that “due to the amount of information required to complete your request, we are requesting an extension of time until June 9th, 2017 to complete your request.” This date is two days after the next scheduled Montclair Board of Education meeting. OPRA guidelines dictate that records should be made available within 7 business days of the request. OPRA also states that contracts, vouchers, bills and budgets should be made available immediately after requested. Unfortunately for the taxpayers of Montclair, this OPRA request, which now needs to be fielded by a staff member of the Montclair Board of Education, will take that staff away from the core mission of the district, which is to educate our students. Had that information been readily available online, our entire education system would be more transparent and financially more efficient. We reached Montclair Board of Education President Laura Hertzog via email about why no supporting documentation is published online prior to each meeting. She responded “The materials generally go up fairly shortly after the meeting.” We pressed further, asking if she could define ‘fairly shortly’, and told her we were specifically addressing the May 16th meeting. We asked why this documentation is not posted a week before each meeting so that the public can assess and inform themselves before the meeting, and what is the point of having an open public comment session at each meeting if no one is provided with the information necessary to understand what’s being talked about at that meeting. All of this could have been avoided and would not have taken up the district staff and board members time, had the Montclair Board of Education followed the example set by the municipal government of Montclair and their transparency policy. The Montclair Dispatch reached out to Barbara Pinsak, Interim Superintendent, and Jessica Di Koninck, former President of the Board. In an effort to determine why no supporting documentation is available online prior to or after Montclair Board of Education meetings. Either these individuals were unwilling or unable to respond prior to our deadline.